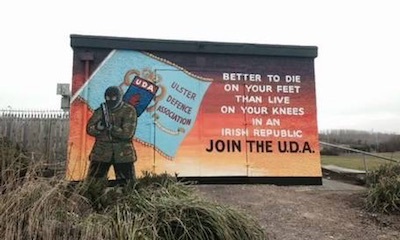 A new mural calling for people to join the UDA was recently painted in Carrickfergus, County Antrim, prompting fears that the unionist paramilitary group is again recruiting. Alliance assembly member Stewart Dickson said the painting was a “recruitment mural for the UDA”. Meanwhile, a controversial loyalist memorial built in breach of planning rules is set to be retained, despite its ongoing use as a location for UDA and UVF shows of strength. The ‘garden of reflection’ off the Ormeau Road sparked controversy after it was revealed it was built with a five-figure sum provided by the Stormont administration’s Housing Executive (NIHE). Unionist politicians have argued that renewed signs of loyalists paramilitarism should be seen in the context of a recent decision by Newry and Armagh council to retain the name of 1981 hunger strike martyr Raymond McCreesh on a park in Newry. Unionists have also condemned Sinn Fein’s renewed efforts to strengthen the Irish language in the north of Ireland as an attack on their British culture. This week Sinn Fein began consultations on an Acht na Gaeilge (Irish Language Act), which the DUP has vowed to block.